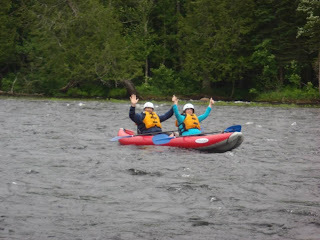 Northeast Whitewater: Moosehead Lake Adventure Destination: The Best Whitewater Rafting for your Family Retreat! The Best Whitewater Rafting for your Family Retreat! Our summer season is underway at Northeast Guide Service and we sure have been busy with lots of rafting trips down the Kennebec River here in Northern Maine. The 15th of June was our first Turbo-charged Kennebec trip of the year. Four times each season, there is a turbine test water release, causing the Kennebec river to swell to nearly twice the water flow, from 4800 cubic feet per second to 8000 cfs. Thats like seeing 8000 basketballs spilling out of the dam per SECOND! Big Water Day is one of our favorite days to run the Kennebec and we had a great crew to do it with. Our crew was a big mix of first timers as well as some old friends that have joined us on countless adventures. The day started off a little chilly but the high volume water had us paddling all day and keeping warm as we crashed into rapids twice as big as usual. On June 19, we had a beautiful day and super high water levels to make our adventure that much more thrilling. Two of our guests traveled all the way from Missouri to join us on the Penobscot River, but due to all the rain we've had this month, we unfortunately were not able to go to the Penobscot as the water levels were more than double the maximum level for commercial guests. Taking our 13' Sport Rafts on the Kennebec River was a great alternative. The sport rafts are the smallest rafts on the river and fit just 4 people, so every wave and every rapid we hit seem that much bigger! This complete transformation, mixed with the already inflated water levels, makes the Kennebec nearly unrecognizable. We also had some young Greenville natives on their first trip down the river and no end to the fun and smiles, so take that, weather man! Just two days later, we had another beautiful day to accommodate an action-packed family reunion all the way from Hawaii and California. What better way to celebrate your family than having a whitewater rafting family reunion!? For their family vacation, this group booked on of our overnight rafting trips; they had a day of inflatable kayaking, the opportunity to fish and swim at our private island overnight site, delicious camp cookout meals, and of course, a day on the Kennebec. In addition to our friends from across the country, we also had some guests from Maryland and Bar Harbor helping to bring the sunny weather our way. This trip was packed with lots of younger rafters, but no one backed down from the mighty class IV rapids, not even Big Mama could stop them! After our California and Hawaii guests left, they seemed to have taken the sunshine with them. The water, however, stayed with us here in Maine. We took our Sport Rafts out again and had a wild time in the high volume water of the Kennebec. No one even noticed when it started to rain because there were rapids crashing all around us and no way to tell the raindrops from the river. By the time we got done with lunch and on to the lower half, the skies had cleared and we had great energy for the ride out. Our trip on June 24th started out a little rainy, but by the time we got down the rapids the sun started to poke its head out of the clouds, making it warm enough for nearly everyone to jump out of the boats and swim on one of swimmer-friendly rapids. The favorite rapid of the day, by consensus, was Big Mama, a popular for many trips. Some of our guests even brought their own go-pro video cameras to attach to their helmets to get extra action-packed footage of the day. On June 26th we had a smaller crew, but everyone brought double the energy so our day started out at a fast pace. We had guests from all over- as close as Boston, down to Florida, and even out as far as Germany! It was hard to say which part of the day was better- the heart-pumping thrill of hitting some huge rapids at the class IV Whitewasher, or the riverside cookout complete with steak and chicken barbecue, our famous river rice, pasta salad, BROWNIES, and more! Lucky for us after this feast we've already been through all the class IV's so the bottom of the river is perfect for relaxing. This group had so much fun that some deciding to sign on for another day of rafting later this week! The following day we had another big group come out with us for their yearly family vacation, although this family was comprised of five different families all merged into one big group of great friends. Even the other guests on the trip felt apart of this friendly bunch. The sun didn't quite make it out but the rain held off and the whole day was a great success. At Swimmer's Rapids, almost every single person in our 35-person group got out to enjoy the rapids from a different perspective- in the water! On the lower half, after all of the big rapids of course, we had more inflatable kayaks than I've ever seen on one trip! Some of the kids from the large group had the two-person duckies out and the battle was on- if we had trophies, we could have awarded them for the fastest kayaking, the most in-sync paddling, the most creative paddling, the most splashes delivered to parents' boats...the list goes on. Everyone's high spirits were contagious throughout this family rafting trip and with a vacation plan like that, they may have even accumulated a few more family members! Our trips are growing in number and size each day as we approach the end of June and look forward into July. The best way to plan a vacation is to include some of the best whitewater rafting adventures in New England by joining us on the Kennebec, Penobscot, and Canada Falls rivers! 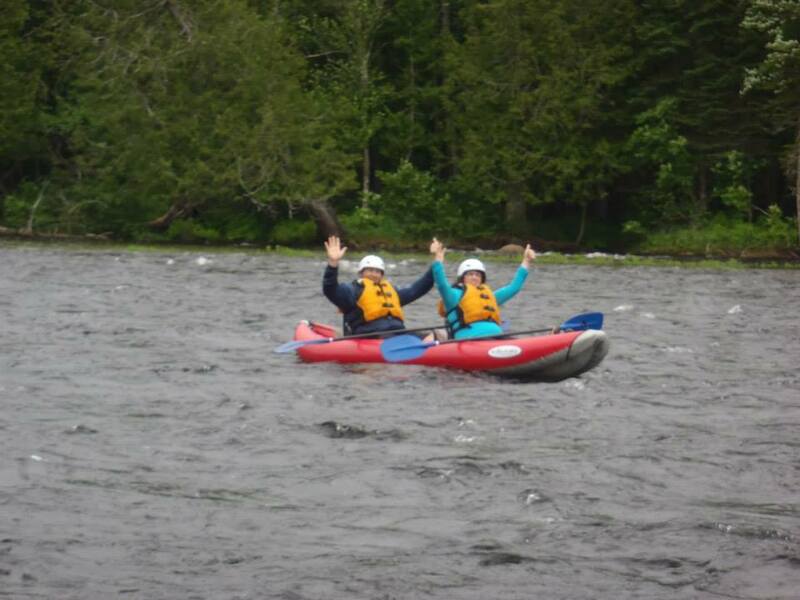 We can't always guarantee the weather (although we try), but the heart-pumping class III-V rapids and beautiful scenery of Northern Maine are here rain or shine, don't miss boat and call to set up your Maine adventure today!